When you only have a limited amount of daylight in which to get your work done, you find a way to work quickly. 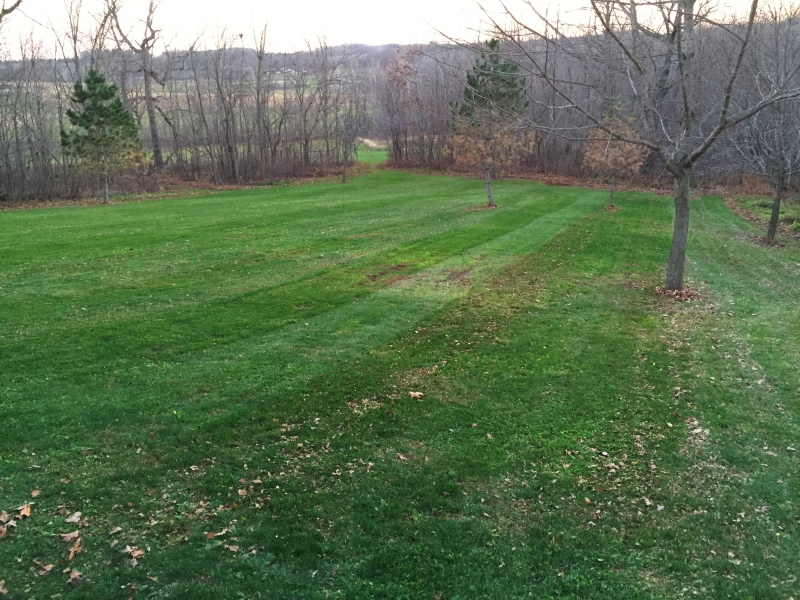 After seeing how nice the front yard looked after I mowed it to a close cut on Sunday, I desperately wanted to have the same result in the back. With the beautiful weather blessing us for another day, I made a point of rushing home from work and changing into grubby clothes. 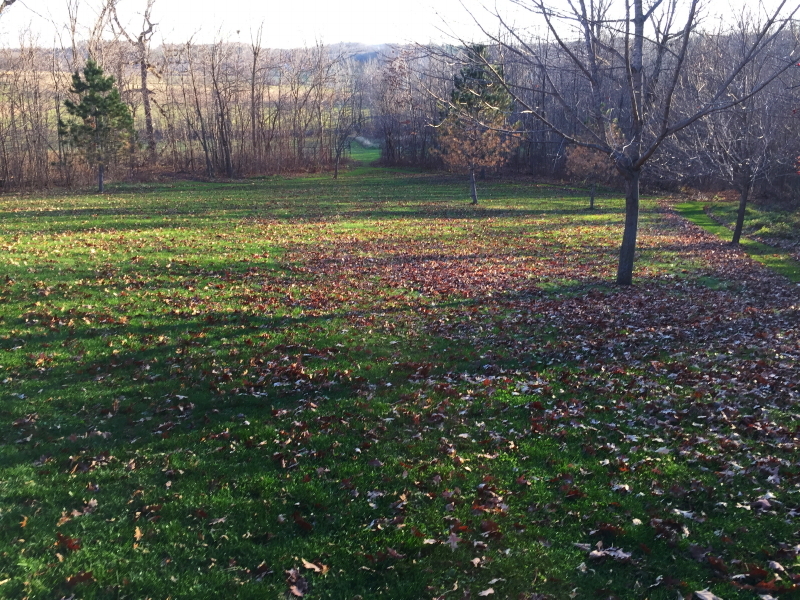 There wasn’t much that needed to be done in preparation, so in no time I was on the back hill mowing all the leaves that had fallen. I made one pass around the perimeter and stopped to take a picture, hoping to get a “before” and “after” combination. That image was lit with sunshine that would last barely another hour. Unsure whether I would have enough light to get an “after” shot, I picked the angle for this view and got down to business. Since I was cutting very short, areas where the moles have wreaked havoc became much more glaring than when I leave it longer, but taken as a whole, the turf landscape looked rather noble by the time I was through. Before snapping the second shot, I snuck a peek at the first image, because I’d already forgotten where I had stood to take it. For as little effort as I put toward aligning them precisely, I am tickled to have ended up with a shot that almost perfectly matched the earlier view. The only thing missing was the sunshine, which was below the horizon by that point. The hill is ready for becoming a sled run, in the off-chance we end up getting enough snow for that this winter, what with the “Godzilla-of-all-El-Niños” forecast to be moderating our temperatures in the months ahead. If our current spell of good weather fortune is any indicator, we could be in for a short ski and igloo season this year. Re:the turf landscape looked rather noble by the time I was through – it certainly did!